Why do we say upside-down instead of downside-up? They're both true--the top becomes the bottom and the bottom becomes the top, yet downside-up is pretty much never used. These are the questions that keep me up at night. I won't beat around the bush: This is one of the easiest, most lovely and delicious cakes I've made in a long time. It takes about 20 minutes of active work, which is well worth the spectacular finished product. Heck, I might even be willing to put in a full half-hour for this one. The cranberries are beautifully vibrant and, it's important to note, consistently come off the pan perfectly (knock on wood). On top of the attractive downside that came up, the cake is so tasty. Buttermilk in the batter makes the cake part very moist, and it has a great crumb too. The deal-sealer is the topping. The cranberries are tart, but that makes them a perfect balance to the sweet, buttery glaze that forms atop the cranberries and in their nooks and crannies. (Cranberry crannies.) The walnuts might seem superfluous, but they're not--their crunch and nuttiness is important too! Lest you be misled by my title, there is no downside to this downside-up cake. It's simple, scrumptious, and stunning. I can't promote this cake enough--make it now and be dazzled! Melt butter in a 9-inch skillet or sturdy cake pan* over moderate heat, then swirl to coat bottom and side of skillet and stir in brown sugar. Simmer, stirring, until sugar is dissolved, 1 to 2 minutes, then sprinkle cranberries and walnuts evenly over butter mixture and remove from heat. *I boldly used a regular 9-inch aluminum cake pan over a gas-lit eye on my stove-top, and it didn't scorch or anything. Your mileage may vary. Whisk together flour, baking powder, baking soda, and salt. Beat together butter and sugar in a large bowl with an electric mixer at high speed until light and fluffy, 4 to 6 minutes. Add eggs, 1 at a time, beating well after each addition. Beat in vanilla. Reduce speed to low and add flour mixture alternately in batches with buttermilk, beginning and ending with flour mixture and mixing until just combined. Heat topping in skillet over moderately high heat until it starts to bubble, then gently spoon batter over topping and spread evenly. Quickly transfer to oven; bake until cake is golden brown and a wooden skewer comes out clean, 25 to 30 minutes. Cool cake in pan on a rack 15 minutes. Run a thin knife around inside edge of pan, then invert a serving plate over pan and invert cake onto plate. Cool completely on plate on rack, 1 hour. Serve cake at room temperature. Magnificent! Upside-down cakes are great and I love this version. Glorious. Definitely my kind of cake! This looks like a cake even I could attemtp! I love the look of the shiny fruit on a downside-up cake. The walnuts and cranberries sound like a great final top! 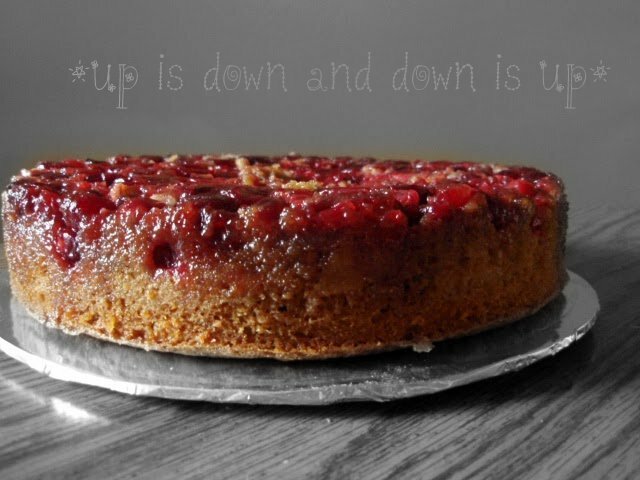 Whichever way you "flip it" your Cranberry Walnut cake looks scrumptious! Your cake looks spectacular and mouth-watering! I can't wait to try this gorgeous recipe. Mmmmm. I've never made an upside down cake before. This one looks like a great one to start with! Cranberry Upside Down Cake was one of most successful recipes last year....I'm going to add nuts to it next time. Would never have occurred to me! Haven't baked a cake in ages and this looks like a scrumptious starting point.I don't have a skillet that is that thick, but think I could adapt it to a pan..... what do you think? Thanks for posting this, can't wait to try it. I need a bib when I come to your blog! @Patricia: i should have added that i used a regular 9-inch cake pan in lieu of a cast-iron skillet! i've edited the recipe, and i'm here to tell you that it works just fine--just be careful! Hmmm I've never thought of it that way, but you are totally right. Upside down makes absolutely ZERO sense! I'm so glad I have cranberries in my freezer. Need this in my life. LOL! Love reading your posts....That cake looks amazing,Grace! oh. my. goodness. Is this real?! looks so delicious! How gorgeous! 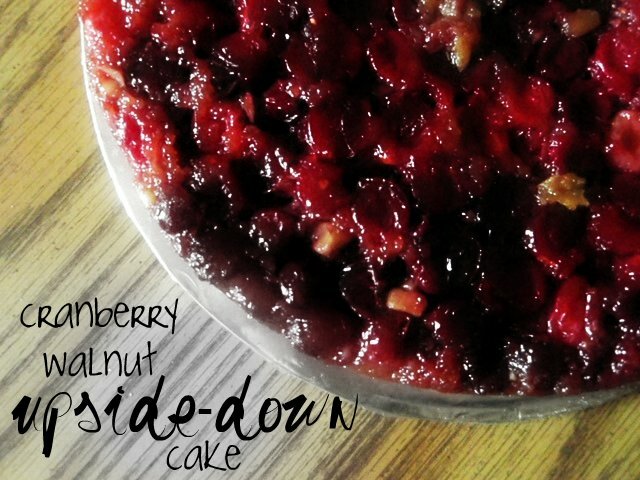 I love downside-up cakes and think I happen to have some cranberries in my freezer. That color is incredible. i went the entire fall without baking anything cranberry! this post just made me realize that! I just made a cranberry cake! I think they're the perfect berry for cakes - the tart always balances out with the sweet. I will make upside down anything, yet haven't done a cranberry one. Love the look of it! Thank goodness I hoarded some extra bags of cranberries in my freezer. This cake looks amazing. Did I ask you if you were watching Continuum? It's so funny that you posted this recipe today Grace, who needs Thanksgiving to enjoy such yumminess anyway! I just happen to just bought some fresh cranberries and now I don't have to go through my bookmarks to find this cake!! !